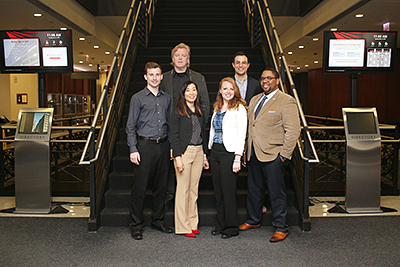 The 2018-19 class of SSPI participants started in February 2018. Five participants were selected through an application process that required detailed business plans. On January 15, 2019, Jordan Powell ('07), partner at Passen & Powell, led a discussion on effective negotiation strategies for lawyers. 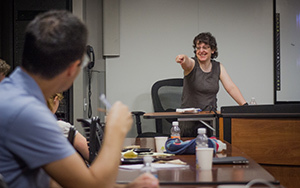 SSPI participants learned how to create a systematic framework for handling disputes through the negotiation process. 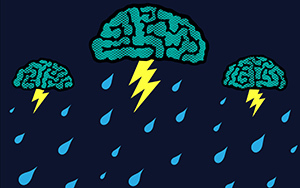 They also learned how to approach negotiations with a strategic and tactical mindset to communicate persuasively with the other side and achieve the very best outcomes for their clients. 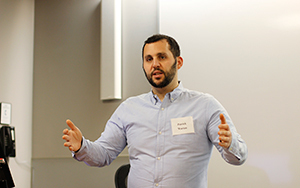 Jordan Powell ('07) provides guidance to participants on negotiating to obtain the best results for your clients. Alycia Sutor provides business development strategies to the participants. Andrew Greene discusses determining your target market. 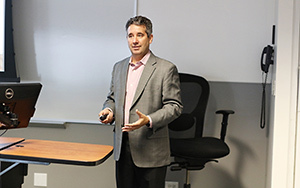 Andrew R. Greene from ASG Law, LLC provided our participants with strategies in aligning marketing, pricing, and high-level business decisions to maximize productivity. In particular, Mr. Greene addressed the importance of time, money (your money), money again (your client’s money), your services, and your target market. He also discussed the importance of creating "internalized rules" for your firm (e.g., work hours, deadlines, response time, etc. ), time and/or matter management systems, communication tools, forms/templates, and office procedures. 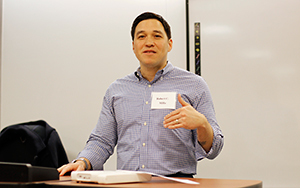 Nelson Rosario ('14), principal at Smolinski Rosario Law P.C., and Debbie Ginsberg, Chicago-Kent’s educational technology librarian, shared their knowledge and expertise in the emerging area of cryptocurrencies and blockchain. The discussion focused on the fundamentals of these new technologies and their importance in modern law practice. Nelson Rosario ('14) answers questions about blockchain technology in modern legal practice. Debbie Ginsberg explains how blockchains are capable of creating "smart contracts." On July 31, 2018, SSPI participants gathered together for a “brainstorm/sharing information” session on all things related to small firm practice. They shared what’s working, what’s not, and bounced off ideas on everything from marketing strategies and networking groups to practice management tools. In addition, each participant provided a 30 second succinct self-introduction (or “elevator pitch”) to their fellow colleagues. 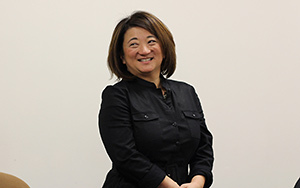 Courtney Fong ('07) uses a water bottle and cup to explain best practices to a risk-based approach to practicing law. 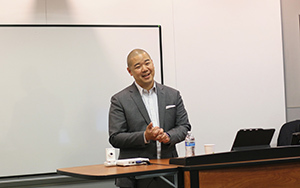 On June 21, 2018, Courtney Fong (’07), Chief Legal Officer & Chief Privacy Officer at Comp TIA, provided SSPI participants with practical considerations that frame a risk-based approach to the practice of law. 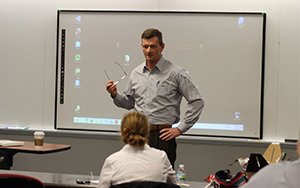 Topics included time management, client engagement, subject matter expertise, and professional development. 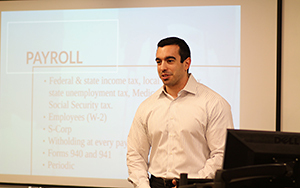 Andrew Gordon ('12) provides accounting and tax strategies to participants. On May 14, 2018, SSPI participants brushed up on their accounting skills and learned how to effectively plan for the business and tax consequences of opening a practice. 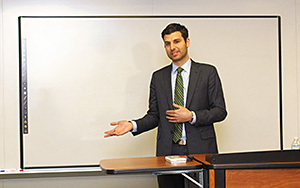 Andrew B. Gordon ('12), an attorney and C.P.A. from the Gordon Law Group and GLG Accounting, provided participants with helpful tips in choosing the best type of entity and tax classification for a new business. He also discussed bookkeeping strategies, including tips on recording income and expenses, reconciling transactions, choosing a bookkeeping cloud-based platform. Lastly, Mr. Gordon discussed the importance of filing your business tax returns and setting aside funds to pay your business taxes. Judge Hartigan discusses managing firm costs with participants. 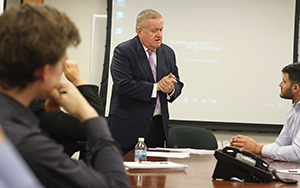 On April 19, 2018, the Honorable Judge Russell W. Hartigan, partner at Goldstine, Skrodzki, Russian, Nemec and Hoff, Ltd., and president of the Illinois State Bar Association, shared strategies in law practice management, including operational essentials, managing costs, profitability, managing risk, marketing, and ethical considerations. Debbie Ginsberg shares tech essentials for the solo practitioner. 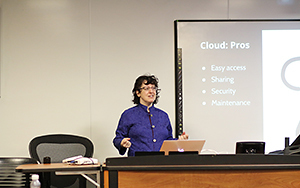 On March 13, 2018, Debbie Ginsberg, Chicago-Kent's technology librarian, provided SSPI participants with her top five tech essentials for solo practitioners. Participants learned about various hardware, software, on-the-go technology, and management tools to help lawyers increase productivity and efficiency for their firms. 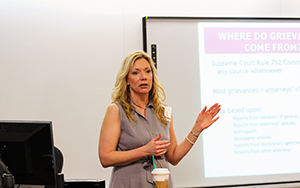 On February 23, 2018, SSPI participants attended an all-day boot camp that provided essential information on getting a successful law practice up and running. Dean and Professor of Law, Harold J. Krent, welcomed the new lawyers to the program and Dawn Young, director of Institutional Projects, moderated the training, which included presentations from seasoned IIT Chicago-Kent alumni and business professionals in the community. 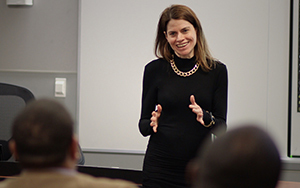 Professor Heather Harper discusses creating "organic growth" in a law practice. Robert Milla ('06) provides strategies in obtaining and retaining clients. 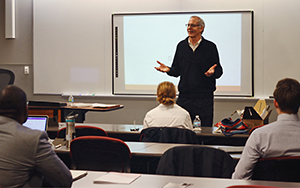 Michael O'Connell ('79) provides a primer on engagement agreements and retainers. 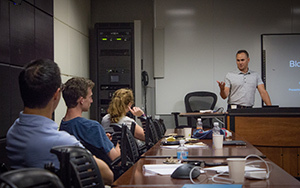 Patrick Wartan ('10) discusses the value in creating niche practices. Melissa Smart from the Illinois ARDC provides helpful information in creating an ethical practice. Ron Bockstahler, CEO of Amata, welcomes SSPI participants to the program. On February 14, 2018, SSPI participants and their mentors attended a mentoring orientation session presented by Dawn Young, director of Institutional Projects. The orientation provided an overview of the mentoring component of the program, including its purpose and goals. Mentoring pairs then participated in break-out sessions to develop and create structured mentoring plans to customize and chart the progress of their learning experience. Lance Northcutt, Commissioner from the Illinois Supreme Court Commission on Professionalism, welcomed the attendees and provided some words of encouragement and support. Entertainment lawyers - Odell Mitchell (left) with his mentor Heather L. Blaise (right). 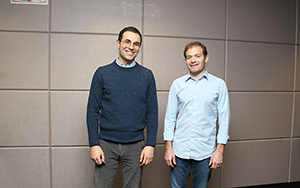 Lawyers leveraging technology - Nick Bartzen (left) with his mentor Scott Weisman (right).